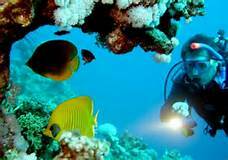 Diving in Costa Rica is unusual in comparison to traditional diving destinations. Because of vast amounts of plankton and other organisms in the Pacific Ocean, there is an astonishing amount of large marine life that can be seen on any given dive. Visibility ranges anywhere from 30′ to 100′ and the temperature of the water averages 80 degrees F.
Guanacaste’s​ (Northwest Province) coastal waters offer a spectacular array of large marine life ranging from a tiny fluorescent damsel to a six foot white tip reef shark to a possible encounter with a giant manta. For the more experienced and daring this area offers a chance to swim side by side with whale sharks, bull sharks and much more. The underwater landscape of cliffs, canyons, and tunnels makes for some of the most adventurous diving in the world. 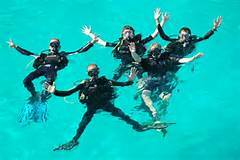 ​The best diving months vary widely, depending on your location. 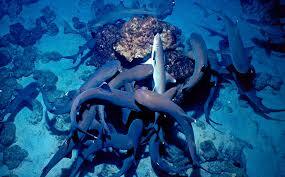 The best months to dive Cocos Island, especially if you want to see hammerheads, are June, July and August. Operators who frequent Cocos generally dry-dock their boats in November and December. November through April are the best months to dive the Osa Peninsula. In May, the windy season begins, and conditions can be rough. The best months to dive off Guanacaste are its rainy season, May through November, as the water conditions are calm. Some diving can be done off Guanacaste during the windy season (December through April); however, operators don’t make the crossing to the Bat Islands during these months.